For a high school student with a rigorous course-load, a spot on a varsity sports team and involvement in other extracurriculars, working a part-time job may seem impossible. However, having a job is a valuable experience that can teach teenagers many skills they will need to succeed after high school. Whether a part-time job year-round or just a summer job at an ice cream shop or a summer camp, students should seek out a job at some point during high school in order to improve their work ethic, time management and communication skills. Senior Kaelyn Padgett has had a job at Panera Bread since the spring of 2016, and said that having a job has given her time and money management skills. Padgett works once a week every Saturday, which she said works best for her amount of schoolwork. 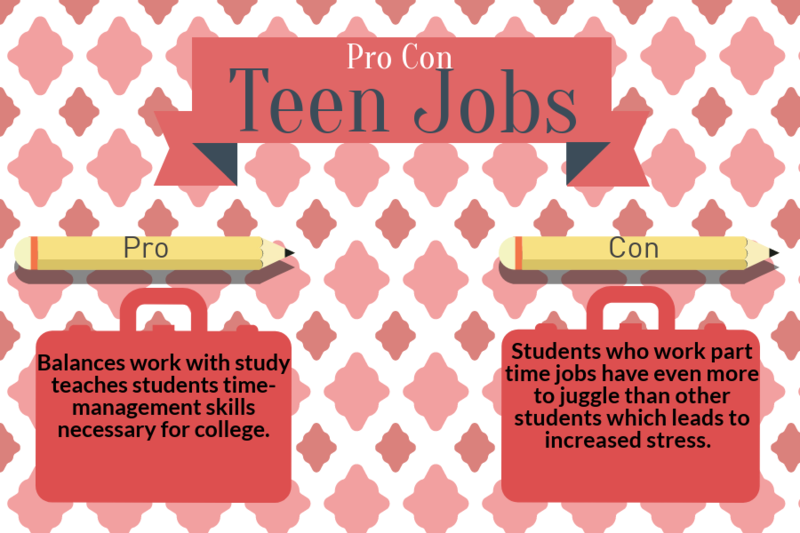 According to a 2010 National Institutes of Health (NIH) article on advantages and disadvantages of adolescent employment, working consistently, but not too much where it interferes with school, teaches students time-management skills necessary for college. While college-bound teenagers can benefit from having a part-time job, students planning to go straight to the workforce can gain experience early on from a job. While jobs can be beneficial for those who seek them out and are able to realistically balance them with school commitments, some students who are obligated to work to provide for their family may be overworked. Additionally, different employers have different expectations of how often employees work. To mitigate these concerns, there are many federal regulations placed on minors to regulate hours and conditions that they work under, such as a limit of hours worked per week and not during school hours for minors under 16 years old, according to the U.S. Department of Labor. While having a job may seem at times unenjoyable or hard to manage, it provides valuable experience with time and money management, as well as experience dealing with different types of people that will prove beneficial later in life. If even just during the summer, it is important that adolescents seek out employment before graduating high school. Teenagers can decide to work part time jobs for a variety of reasons, such as wanting money or to gain experience for future employment. Many students here at RHS have a part time job, or want a part time job. However, the negatives of students taking on part time jobs greatly outweigh the positives. Ninety-seven percent of young adults have worked a job between the time they leave high school and when they turn 22, according to data collected by Child Trends. High school students should not be working part time jobs during the school year because they need to focus on their studies and school-related extracurriculars. Students manage a heavy workload, and it is easy to see how students grades can drop when confronted with the choice between working a job and studying for a quiz or doing homework. Since students have less time due to their job, they spend less time doing homework and studying. Students at RHS have had to make this choice and it has ended badly for some of them, often choosing not to do homework for certain classes in order to get sleep. “I began falling behind because I was always tired from getting little sleep because I did my homework after work,” junior Lily Hernandez said. Along with extracurricular activities, homework, studying and having free time, students who work part time jobs have even more to juggle than other students which leads to increased stress. The opposition argues that working a job during high school gives students more responsibility and experience for them to use later in life. However, there are better ways to gain experience that do not cause extra stress and reduced sleep for students. Often students do not want a job to gain experience, but instead are doing it in order to earn money, while still suffering from all of the negative effects on their school life and studies. Although it is understandable that students may want to earn extra money or gain experience, a student’s grades and health should always be a higher priority. Students can begin to gain experience through a summer job or working on the weekends. Students can also volunteer and even use the time spent volunteering for Student Service Learning (SSL) hours. While students are in school, they need to focus on their studies. No one should ever have to choose between working a job and studying for a test. As a student, one’s education should be very important and earning money should never be a detriment to that.